← Market Timing Brief™: Will Dr. B. Spoil the Rally? Based on the 7-20-2012 Close published Sunday, 7-22-2012. 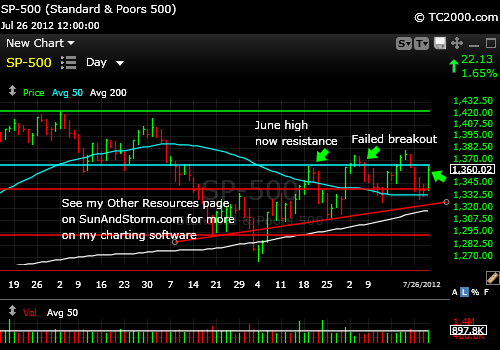 UPDATE AT CLOSE ON 7-26-2012: We could fail from here or at any resistance point up to last high. Over the last high and on up we go. If we get there. What does this mean? It’s a bad buying point. Wait to add in my opinion. More below. SP500 Index Market Timing Chart at 7-26-2012 Close: We are just under resistance at aqua line. The other highs just above here are resistance as well, but we are rallying for now. See my Tweets from today on the right side of this page or on Twitter. UPDATE on 7-24-2012: The SP500 Index did in fact pull down from the triple top I wrote about this past weekend. It came down to trend line support yesterday at 1335 and bounced back up through and closed above the 50 day moving average, which is now nearby support. Note that the past THREE lows were created by “two step” moves down in the SP500 Index. After the first move down, there was a pause for a day the prior three times and then the second move down to the low or fairly close to it in the case of the prior swing down. Then there were 2-4 days of hanging around the new low and retesting it (in the case of the 6-28), followed by the upsurge lasting 5-10 days. The market recapitulated that same pattern in just two days (Friday and Monday). We could now redo the rest and bounce. I believe that any disruption of this pattern, which would occur if the SP500 Index should make another significant move down (it would look like a “jerk” down as it did both Friday and Monday), would result in greater damage than the initial with a possible retest of 1309.27, the 6-27 low or the early June low of 1274.16. What are the practical points here that can be made? 1. Buying yesterday near the prior trend line formed by the series of daily lows over the past couple of months would have worked, at least thus far; however, the market is continuing to weaken as I type this, so “jerk down” #3 may be here. 2. The next buy will be a move up through the prior high of 1380.39. 3. SP500 of 1325.41 would be the target should there be another “jerk” down. The banking index (BKX) started to register trouble even before the Friday decline in the stock markets. The BKX has formed a triple top and is coming down. I’ve heard divided opinions about how good or bad the earnings season is, which is why we are probably seeing a move of the SP500 Index back down into the recent range. When markets don’t know where to go, they go sideways. They do not continue upward. Since we are moving down, perhaps the Bears would say that the slowdown is going to surprise the markets in the end. The Economic Cycle Research Institute that correctly predicted this slowdown has said that the slowdown would be mild unless gas and oil prices have gone sky high. Remember I said that we needed another breakout in biotech to make it a buy? We are still waiting for that breakout. The first one failed. Utilities remain in an up trend. Good yields are vanishing from markets all over the world. Stocks become more attractive in relative terms, even when an investor can only get 2-3% in dividends. If interest rates were to move back up, it would mean trouble. The stock markets are at the current level, because rates are very low, abnormally low. Muni bonds are on a tear both because interest rates are headed down AND because the Bush tax cuts are in danger of being repealed. President Obama’s agenda for his last term will be to reverse those tax cuts and drive marginal tax rates back up toward what they were under Bill Clinton. I am not saying whether that is good or bad. I am too smart to state that in a financial newsletter. What I can say is that if the Bush tax cuts are repealed, munis will benefit further. The world’s central banks stopped printing money. That is obviously not happening. The world’s economy goes into a deflationary spiral, which would likely only happen if #1 happened. Dr. B has not revealed any inclination to let off the monetary gas pedal. The SP500 Index fell dramatically in value. Valuation is relative. This entry was posted in Biotech, federal reserve, gold, gold etf, investment, Market timing, municipal bonds, S&P 500 Index, trading, utilities and tagged BTK, gld, gold etf, ibb, market timing, municipal bonds, qqq, sp500 index, spx, spy. Bookmark the permalink.